A public safety meeting Thursday will discuss personal safety, crime prevention and advocacy to increase police presence. Capt. Phil Kwasinski will be guest of the East Village Association and Ukrainian Village Neighborhood Association in a special meeting at 6:30pm in Bath House Cultural Center, 1019 N. Wolcott Ave. Aldermen Proco Joe Moreno (1st Ward) and Brian Hopkins (2nd Ward) will attend. We're asking our members to write letters demanding urgent action on crime. Sample letters will be available to sign at the meeting, and letters will be collected to be presented to city officials. Those who can't attend can download and send letters directly to Mayor Rahm Emanuel and their alderman (find your ward here). Kwasinski will address crime levels and police strategies to address crime. 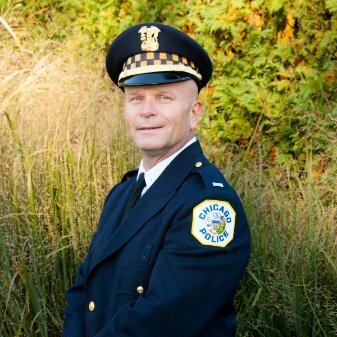 He's a 31-year Chicago Police veteran, promoted to 12th District captain in 2015. Previously he spent five years as tactical lieutenant in the 10th District. As a sergeant, Kwasinski managed the non-emergency Alternate Response Section and acted in tactical and patrol roles. The Taft High School graduate holds a master's degree in criminal social justice from Lewis University and a bachelor's degree from Western Illinois. Unease over crime has risen this month after a string of carjackings in the area. One recent arrest potentially cleared 10 vehicle thefts or carjackings, police said at an an Aug. 23 antitheft seminar at St. Helen's Church. Police have had to operate under anpower limitations. The number of officers assigned to the 12th District has dropped from just over 500 officers when the 13th District closed five years ago to 300 officers today. Community members at the meeting will learn how to avoid burglaries, assaults and carjackings, and will discuss neighborhood efforts to prevent crime, including more political action.